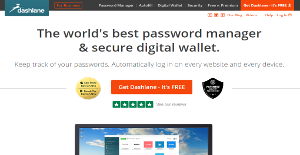 Dashlane is a password management solution that enables users to efficiently organize their passwords and store them a in a centralized, secure location. Once your passwords are processed and stored, you can easily access them wherever and whenever you need them. Dashlane also offers an autosave password feature that automatically types your passwords for you the next time you log in. All passwords entered into the Dashlane system are protected with AES-256, the world’s leading standard when it comes to password and data encryption. Dashlane even guarantees that their personnel have no access to your encrypted data. This has been highlighted by many observers and experts in password security sector, saying Dashlane was not affected by the most recent Heartbleed security hack. Described by password management and data security professionals as one of the most robust and secure password management platform, Dashlane is a very effective and efficient solution for business and individuals who value their passwords and keep them safe from hacks, leaks, and unauthorized access. Easy to use and simple to implement, Dashlane automatically keeps track of your passwords and immediately sends them to an encrypted password vault. Are you making a new password for a new social media account? Dashlane will remember it. Forgot a few passwords? You can bet they’re in Dashlane’s very secure password vault. Dashlane also speeds up your workflows and processes as it automatically enters your passwords the moment you log in to your account. This feature works even on complicated password fields such as bank accounts. Do you need to change passwords to multiple accounts? Dashlane accelerates the process with its One-click password change functionality. Whenever your passwords are changed, Dashlane remembers the new password and synchronizes it across all your devices. Your passwords are encrypted using AES-256, and more than 10,000 iterations of PBKDF2. Nothing but the best security encryption methods to keep your passwords safe from anyone, even Dashlane. The only one who knows your password is YOU. Since each enterprise has particular business requirements, it is prudent for them to desist from looking for a one-size-fits-all ideal software system. Needless to say, it would be pointless to try to find such an app even among market-leading software platforms. The intelligent thing to do would be to catalog the various important aspects that require consideration such as main features, finances, skill levels of employees, company size etc. Then, you should do your homework thoroughly. Read some Dashlane reviews and investigate each of the other solutions in your shortlist in detail. Such comprehensive research can make sure you reject ill-fitting systems and zero in on the app that offers all the aspects you require for business success. We realize that when you make a decision to buy IT Security Software it’s important not only to see how experts evaluate it in their reviews, but also to find out if the real people and companies that buy it are actually satisfied with the product. That’s why we’ve created our behavior-based Customer Satisfaction Algorithm™ that gathers customer reviews, comments and Dashlane reviews across a wide range of social media sites. The data is then presented in an easy to digest form showing how many people had positive and negative experience with Dashlane. With that information at hand you should be equipped to make an informed buying decision that you won’t regret. What are Dashlane pricing details? What integrations are available for Dashlane? Pros: I can easily export all of my passwords from LastPass into Dashlane. I can easily save and use the form fills, and I found the automated login features helpful. I am able to use Chrome extension and log-in quickly. Cons: I have lot of logins for one site, and I had some problems when trying to fill the form with some personal info that I didn’t want, it requires to use cloud-based program. It would be great if the program could ask me whether I want to try on some site or no. Pros: I can surf the internet without searching for passwords and it makes me feel more secure. I can store great amount of passwords and I don’t have to create special document for writing all of them into it. I like the fact that it automatically logs me in to some websites, thus saving lot of time. Cons: It can be buggy sometimes, sometimes it uses wrong account for some places. Sometimes the screens are block. Also, it doesn’t always signs me in into websites. If you need more information about Dashlane or you simply have a question let us know what you need and we’ll forward your request directly to the vendor.